Learn Java Online: What are the Best Online Courses, YouTube Tutorials and MOOCs? Java courses for beginners are available in various formats. Find below selected beginner courses to learn the Java programming language online. The significance of Java as a programming language strongly increases. This is also because of the huge number of Android apps (estimated at more than 3 million) which are based on Java. Reason enough to deal with Java and to learn the popular coding language! But which Java course is right for you? We show each option below and explain what the differences are. 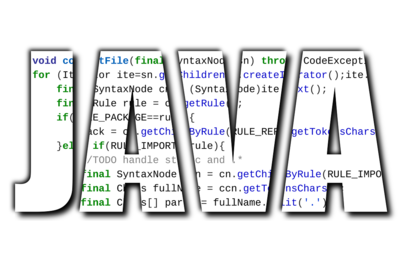 But before we start: What is "Java" anyway? The feature that distinguishes Java from other programming languages is that it is platform independent. An ordinary software must be adapted to the operating system on which it is used. A program for a Windows computer, for example, does not run under Linux. The idea behind Java is to lift this restriction. The trick is that a separate runtime environment, called Java Runtime Environment, is designed for each operating system that Java will run in - for example, Windows, Unix or Linux. Java is also an object-oriented programming language. You can create different objects and then combine them, resulting in a simplification of the software. Sounds complicated? If you do join a Java course, you will understand it soon! Since Java is running on almost all operating systems, there are many possible applications. There are Java desktop applications, working like a regular computer program. In addition, Java is great for web applications. Put simply, Java is mainly used in the backend of websites (i.e. what happens on the server side). Moreover, there are so-called Java applets, small programs that are executed in the web browser. Java also gets increasingly important for mobile devices. Apps for Android smartphones are almost always based on Java. So Java is one of the main coding languages. But how exactly can you learn Java yourself? With YouTube you can get a first impression. The teaching style is casual. But be careful: Not every "expert" uploading videos is always correct about the content. A structured teaching concept is also missing sometimes. And of course, certificates are not available. Conclusion: Can give a flavor of Java to beginners; however, less suitable for a comprehensive, well-structured training. "Java Programming" teaches some basic Java in 30 minutes. "Step by Step Tutorial", which was already viewed more than 10 million times. Some online course providers specialize in coding. These boot camps and similar providers give you a focused training in programming skills. It´s a practice-oriented training that can be used on the job quickly, and it involves writing lots of Java code yourself. Often the courses are fee-based. Conclusion: Focused practical training for fast coding skills; less detailed explanation of theoretical concepts. Codecademy, "Learn Java": Interactive programming course with plenty of project work. The basic version is free, but a lot of content is hidden behind the paywall. Pluralsight, "Java Path": 12 Java tutorials for beginners, intermediates and experts. With an assessment at the beginning, students determine their own level. Treehouse, "Learn Java": Complete Java track including 8 lessons and about 18 hours of total running time. Contains interactive programming exercises. Udemy, "Complete Java Master Class": Video Course for beginners with 300 short video lessons. With MOOCs (massive open online courses), university-level content is delivered over the Internet. The courses come from universities that ensure a certain quality. With MOOCs, you can often learn for free, certificates (if required) are fee-based. Conclusion: Comprehensive programming training from top universities. More detailed video lessons compared to the coding boot camps. "Java Programming and Software Engineering Fundamentals": Series of five individual MOOCs that provide a comprehensive Java training for web developers (Duke University, via Coursera). 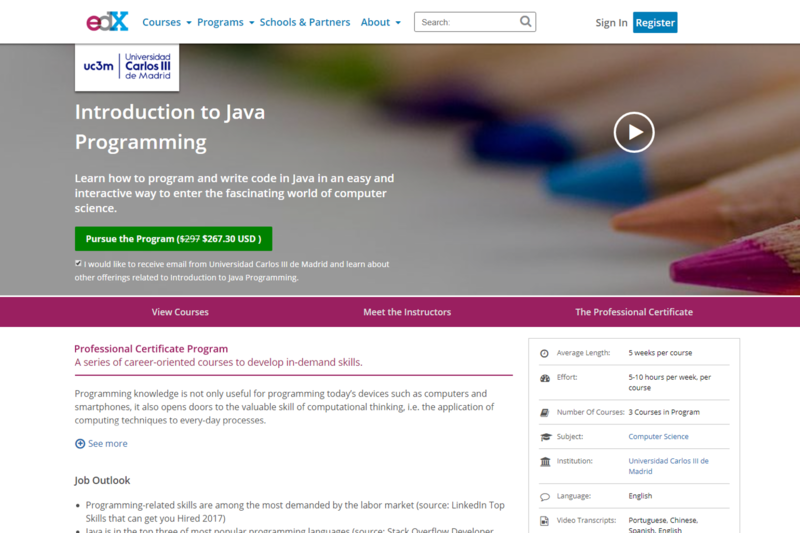 "Introduction to Java Programming": Course series of three video courses by the University of Madrid for a comprehensive training in the programming language (via edX). "Java Programming Basics": Basic course over 6 weeks for Java beginners without any programming experience (course provider: Udacity). Which Java Course is Best for You? For beginners: If you want to take a first tour of Java, you can get a good impression with Youtube tutorials. You can still opt for a "real" course later. For practitioners: If you need Java for your job and have a firm plan to learn it as quickly as possible, the coding boot camps can be a good option for you. For future web developers: Do you want to spend more time with Java and plan to use it in web development later? Or do you need a course certificate for your job applications? Check out the relevant MOOC courses. For computer science students: You can support your own CS studies with Java MOOCs or coding courses to get a firm grasp of Java. What´s your experience? Let us know! Find thousands of online courses from 22 subject areas in our directory. The computer science courses are listed here. With our free Course Manager, you can organize your online learning and set up your individual learning schedule. Are you interested in online courses? Subscribe to our newsletter here. And follow us on Facebook or Twitter!